Mounds of unpacked boxes, with Corey Egan hiding somewhere in the pile. I've always had a love/hate relationship with moving. love the anticipation of being in a new space, of placing all of my things exactly where I want them, getting new furniture (new in my case equals found furniture on the sidewalk or used pieces from Craigslist), putting together tables and cases from IKEA (no really, I should hire myself out for this because I LOVE putting together IKEA furniture) and moving has always felt like a chance to start fresh...and then comes the hate. Finding boxes. Putting things into boxes. Finding tape to tape up boxes. Labeling boxes. Carrying boxes. Realizing that you somehow managed to tape your tape _inside_ an as-yet-to-be-determined box. Along with your scissors. Ugh. 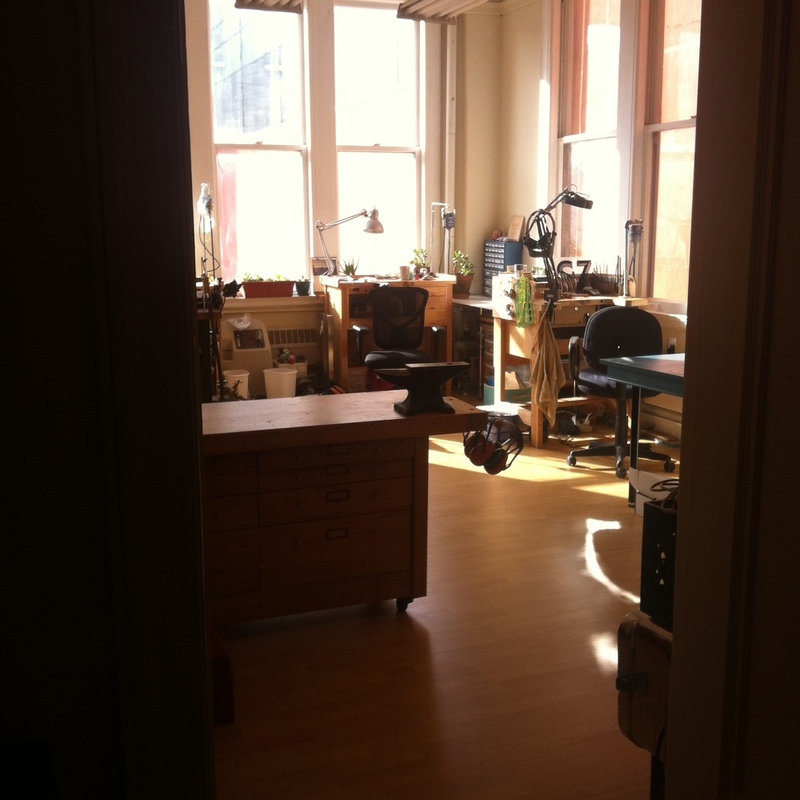 All of this is to say that I moved into a new studio space! Along with the usual excitement and dread that comes along with moving, my studio mates and I also had renovations to complete and space to navigate as a group. The three of us managed this in spite of the fact that one of us (ahem, Luana) had not yet moved back to the Bay Area, so much of this planning happened long-distance and over a period of months. A challenge, but one that we were excited to embark upon as a group. -Pinterest - I created a secret board for all three of us to pin our ideas onto and comment on. This was a great way to keep visual track of fixtures and tools that we already had. We even pinned our own images - the Pinterest app lets you pin directly from the camera on your phone. This board is secret no longer and you can see it here - http://www.pinterest.com/zimmsha/studio-inspiration/ We pinned everything. Practical pins like tools we either needed or had, and aspirational pins like the whale stapler that is totally impractical, but would make my office desk really happy. You can also see a lot of the ideas that we considered but ultimately rejected, or put on the back burner. Ideas like possibly building a loft to take advantage of our high ceilings, the vinyl and laminate flooring that we at one point considered installing ourselves (note, we eventually hired someone to install the floors for us. Best decision ever.) I even did one of the projects that I pinned to this page. The succulents in small pots with a layer of hot pink fish tank rocks? Yeah, I did that one. Who wore it better? Wait, don’t answer that. -Google Drive - When we first decided to be studio mates and talked about tools we might need to buy, it quickly became clear that we had some overlap and that certain tools would be doubles. It was even more clear that the each of us had missing pieces that the rest of us had been yearning for (rolling mill - check. Sandblaster - check.) We maintained a list in a spreadsheet that we could each add to. This list prevented us from running out and buying anything that someone else already had and kept us all within budget. With only 740 square feet to work with and 3 people’s tools and offices to work with, we wanted to keep it simple. So there you have it! The space will probably always be a work in progress, and we still have some bigger ideas to bring to life, but we are moved in and set up and ready to make beautiful jewelry together.